Do you exclaim with exclamation points in your fiction? I totally recommend clicking on Ball’s article to read the whole thing. It’s wonderful, and it made me think about using exclamation points in novel writing. My writing, specifically. While I am guilty of occasional overuse (especially in emails), I do find myself using this much-maligned mark in my fiction. It depends on the kind of story, and the kind of narrator, and how they’re employed, but I think exclamation points can be effective if they’re not splattered everywhere. In my finished manuscript, BODY COPY, there are sprinklings of cheerful upside-down I’s (as my 4-year-old calls them), mostly in dialogue among 20-something girls or in close-in first person remarks. Here’s an exclamation point I took out–see if you can guess where it was. The conversation is between Megan and her catty best friend. “She leaned over and peeled a long strip off my shirt, then she handed it to me. Medium, medium, medium. I originally had an exclamation point after “yourself,” but it’s so wonderfully obnoxious without one. On one of my editing rounds, I plan to scrape away any excess exclamation points and make sure the ones that are left are doing their jobs. With this kind of faux-historical writing, it’s easy to get carried away with excess punctuation. 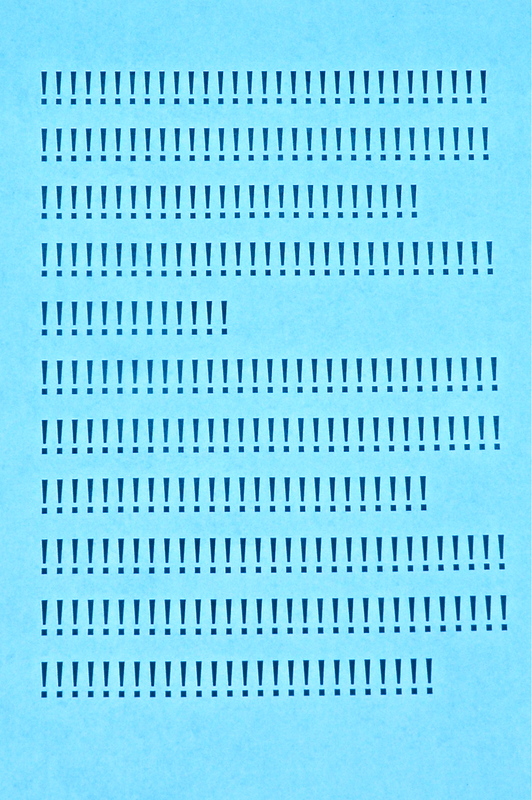 Do you use exclamation points in your creative writing? Or do they drive you nuts? And to Ball’s point, do you use them more liberally in emails, tweets and texts than you do in your fiction writing? This entry was posted in Fiction, Revision, Writing and tagged Aimee Lee Ball, exclamation point, novels, punctuation. Bookmark the permalink. I don’t think I overuse the exclamation point. I just did a search of one story and found ten of them, mostly to indicate raised voice and/or youthful exuberance. All in dialogue, and in mostly in situations where the line would read differently (and incorrectly) without it. Parentheses, on the other hand, I do tend to (over)use. I try to keep it to a minimum in my fiction (but a few do sneak in). Good point about adverbs! I much prefer exclamation points (in moderation, of course). I read advice once which said that when you finish writing something, you should go through and find every instance of dialogue where somebody “shouted” or “cried” or “hissed” or “complained” or “crowed” or whatever and change it to “said.” Then go back and restore the ones you really need. If any. I can’t think of a better use for an exclamation point than in a scream for help, Emerald. Thanks for commenting, and I’m glad you liked the examples. It was fun to open my files and look at how I’ve used punctuation. I can’t either. In fact, I think it’s a perfect use for ‘!’. I guarantee when I pull out my novel to work, I will be looking at how I’ve used punctuation. There are some things I don’t realize I do until someone mentions something about it. I very, very rarely use exclamation marks in my writing; very rarely indeed. On the other hand, I use: lots of em dashes — often deleted on editing — an excessive number of semi-colons — also deleted on editing — and the occasoonal oddly-placed colon — always deleted on editing. And sentence fragments. Lots of sentence fragments. Thanks for your thoughts, Jo. I love your list of punctuation and how often you delete the excess ones. Sentence fragments are grand, aren’t they? They feel so close-in and personal compared to a full-fledged sentence. Sometimes a sentence fragment is better than a full sentence in my opinion. I use them quite often and don’t edit them out. I’ve just now gotten to the point in my writing where I’m getting over my school-bred “correct grammar” and letting myself write fragments! Writing doesn’t always require “correct grammar.” As you have said, it’s all about the creativity! Exclamation points and fragments, hurray! I hate it when well-meaning souls try to “correct” how you write with no sense of your voice or style. Fragments are so great for interior thoughts, because they sound less intellectual and more, well, real. That being said, I have had to watch how I use them. At some point one of my writing teachers pointed out I was employing fragments regularly at the end of paragraphs, and they stood out too much, more like a glitch than the beret and black turtleneck coolness I wanted to achieve. Oops. Apparently the repetition of where they were placed caused them to be ignored, rather than stand out and be special. So now when I’m using fragments, I make sure they’re scattered around! That’s such a good point. It’s the difference in cool factor between one person with a beret and black turtleneck, and the “individuality” of 300 people wearing the same thing. Exclamation points always make me imagine the speaker jumping up and down as they speak. In fiction, especially with younger characters, I think it can be effective if used sparingly. It’s the fifteen exclamation points placed after a ‘hello’ on FB or Twitter that irks me. I start imagining the writer bouncing up and down in the chair as they write, and then I wonder if it’s an office chair with wheels. With each bounce, I see the chair slipping a little further out from underneath them, and I am so distracted worrying for their safety (and their sanity, because is anything really so exciting as to require 15 exclamation points? Is my dear friend simply over-caffeinated, or have they taken up meth? ), that I have to look away. It’s that same cringe factor you get when any other punctuation or device is overused, like the sentence fragment issue Jo and Laura are discussing. Too much of anything used too regularly, or predictably, robs the device of its punch factor. Amy, my pet peeve in this area is people who are so used to typing “LOL” that they type it after every statement they make, including many that I’m sure never had them laughing out loud (and some which aren’t even intended to be funny). One of the many hilarious things about the (late, lamented) comic book Nextwave was that there was a character who actually talked that way (“LOL” “OH NOES!” “ZOMG!”) which tended to confuse and alarm her teammates. I’m so with you there. I hate, hate, hate seeing statements like: “So upset right now. LOL.” Or “Are you okay LOL.” They make me want to triple-kick the computer screen. I feel the same way, Jo. Nothing irks me more than kids writing something and putting lol after everything and like 20 smiley emoticons in the same status update. Oh, and teens these days can’t spell. That’s another thing. “With” is not spelled “wit.” I’m sorry. One more letter won’t kill you to type. I love exclamation points! They are so appropriate! All the time! In every situation! Especially when I’m over-caffeinated! What an absolutely fantastic article. I’m so glad you stumbled onto my blog, leading me to come and visit yours. Exclamation points seem to be like adverbs – there are writers who are emphatically against them, and those who seem to sprinkle them rather too liberally through their work. I confess, whenever I read any piece of writing with too many exclamation points, I wince. However, I agree with you 100% that they are useful and even necessary in some cases. Like any punctuation mark, I think the problem is simply that people don’t always understand how it’s supposed to be used. I’m so glad you came by! There’s something to be said for using any punctuation or literary device properly and in moderation. Except periods. We need those! And as Anthony said somewhere in these comments, “said” is way more invisible than the alternatives. It’s so interesting to read a piece of fiction and diagnose the writer’s proclivities–if they haven’t all been edited out. The flip side, which just occurred to me, is that you can also be phobic about a type of punctuation, perhaps out of fear of using it incorrectly. I has a friend who read my novels and commented that I needed to stop being afraid of semicolons, since there were situations where they were clearly needed and I always used a comma instead. I’m working on improving in that area. Great insight about programmers, Anthony! I would say, though, that the kind of writing you do might allow you to get away with commas instead of semicolons. You’re not after perfect grammar, or writing treatises; you’re after building a world with tension and interesting characters. Sometimes run-on sentences with a few commas give a certain feeling on the page, while semicolons have a more professorial, scholarly feel. That’s pretty much what I’ve ended up with. I have some characters who speak very precisely, and for their dialogue I use semicolons when appropriate. For others, who speak somewhat more colloquially, I don’t use them. Too many exclamation points, guilty as charged. I use them a lot in emails, too–and I’ve noticed how often I use them in commenting on blogs! (See?) If I were on Twitter, I’d probably have the same tendency. Hi, love the tulips! I’m visiting via Anthony’s link. Thanks for stopping by, Tamara! There’s a lot to be said for a cheerful, well-intentioned exclamation point. And if I remember correctly, there were emoticons in one chapter of A Visit from the Goon Squad, which won the Pulitzer. I loaned my hardback copy out so I can’t run and check. If I’m wrong, somebody let me know. I’m saved from having to use emoticons or LOL-isms in my writing by the fact that I’m not writing about the contemporary world. I do have to watch out for slang, though. I had one character who definitely would have said “whatEVer!” quite often, except that people didn’t say it back then. Exclamation marks are not always used to show happiness and jumping up and down. They are used to show the attitude of the writer towards something and to express strong feelings including sadness and pain. They do not always represent shouting but sometimes the opposite. They substitute the extralinguistic features like intonation which are totally absent in writing. They have got a pragmatic force which is lost if they are not used in the appropriate context. Exclamation marks make the sentence have a communicative function.I wonder why people dmonize this IFD (illocutionary force device). The problem, I believe, is that people use them unintentionally in a time they should use them intentionally.